You have written a book. You have read all the books in the Comfy Chair ‘On Writing’ Competition, and more. You know your manuscript is amazing. But how do you convince a publisher that it is, indeed, so amazing that they should publish it? 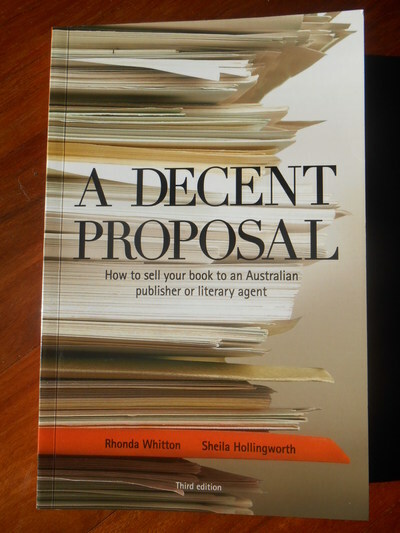 Help is at hand in the form of a small book ‘A Decent Proposal’, a 180-page resource for Australian writers, written by Rhonda Whitton and Sheila Hollingworth. Rhonda and Sheila gained their knowledge through many years of writing, editing and teaching but have also called in the assistance of many other professionals in the field: literary agents, writers and editorial staff from a plethora of Australian publishing houses. How do you define who your readers will be? How do I identify, target and attract potential publishers? Part 2 tells writers how to put together ‘A Decent Proposal’. A chapter-by-chapter account of all the different elements of a book proposal such as: format, cover letter, author info, synopsis, market analysis, chapter plan and how to present a sample chapter. Part 3 offers practical information about contracts, advances, royalties, agents and publishing options. In Part 4, five well-known authors who were published in a variety of genres have kindly given permission to publish their successful proposals as examples. Checklists, quotes from publishing professionals and bits of useful information are scattered throughout the book and make for an extremely useful and entertaining read. ‘A Decent Proposal’ is available from the website of the Australian Society of Authors (ASA), https://www.asauthors.org/dvdbook/a-decent-proposal. Cost around $30. Best organisations in Brisbane for volunteering?